Neil Handelsman joined EMSC in September 1979 and has been a member ever since. In that time, he has served the club as an active member of the Board of Directors, most recently as our Casino Coordinator. He has also represented the club well competitively and still holds 35 club records. Coincidentally, that’s one record for every year he’s been a member! Neil is moving to Toronto this March. On Wednesday February 26th, the Club presented Neil with a small token of our appreciation for his years of service and dedication. Terry Dewhurst gave the following address before the presentation. As you obviously know, we are gathered today to say good-bye to an old friend. It is difficult to say good-bye to long time friends. When you are pushing 80, you realize that you have fewer and fewer of them. 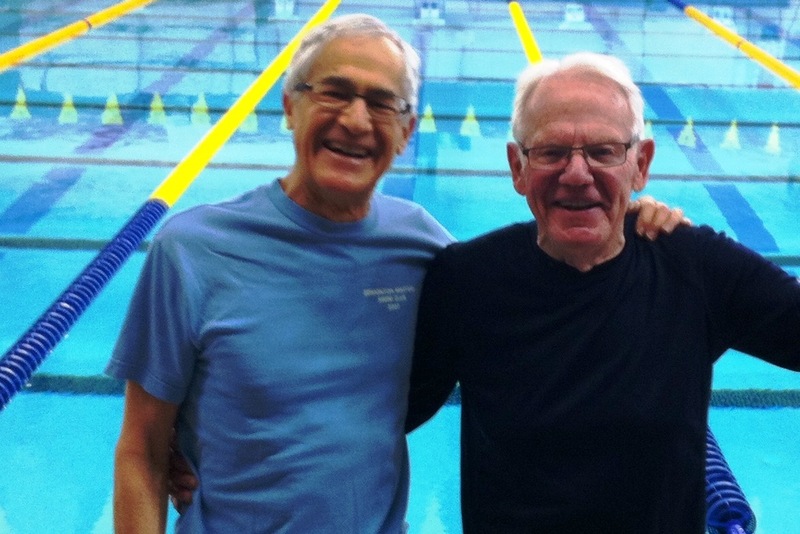 And even fewer old swimming friends like Neil Handelsman. Neil has many strengths but I will just concentrate on four of them. 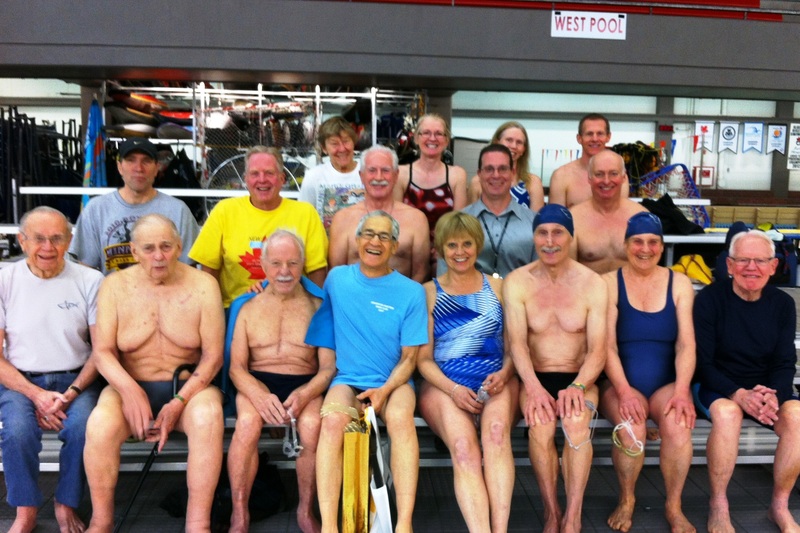 First, Neil is one of the people who built the foundation of the Edmonton Masters Swim Club. It was 30 years ago, so it was a solid foundation, forming a Club that has lasted and has grown. EMSC is known and respected wherever swim meets are held and we have every reason to be proud of the team and thankful for the people who started it. Neil was one of those builders along with Bob McRory and John Sutton. Bob is here today. John has moved to Jamaica. Second, as a swimmer, Neil still holds many club records. He has represented EMSC in meets all across Canada and in other countries. As Bob McRory commented, “Neil just waited patiently until he entered a new age group then washed out the records.” Like it or not, we will be facing Neil when he appears to represent a Toronto club. Third, as a volunteer, Neil has steered our casinos through twenty years of growth. And those twenty years generated over a million dollars in funds, half of which has gone to offset the operating costs of EMSC. And more specifically to reducing the cost of your membership fees. Last but not least, outside of swimming, Neil owned and operated a successful business as a retail leasing consultant. Many of Neil’s leasing ventures involved facilities in West Edmonton Mall. So if you find just the item you have been looking for, you may be buying it from a store whose lease was written by Neil Handelsman. Carol and Neil are leaving Edmonton for Toronto and we want to wish Neil a “Bon Voyage”. And give him a token of our appreciation. 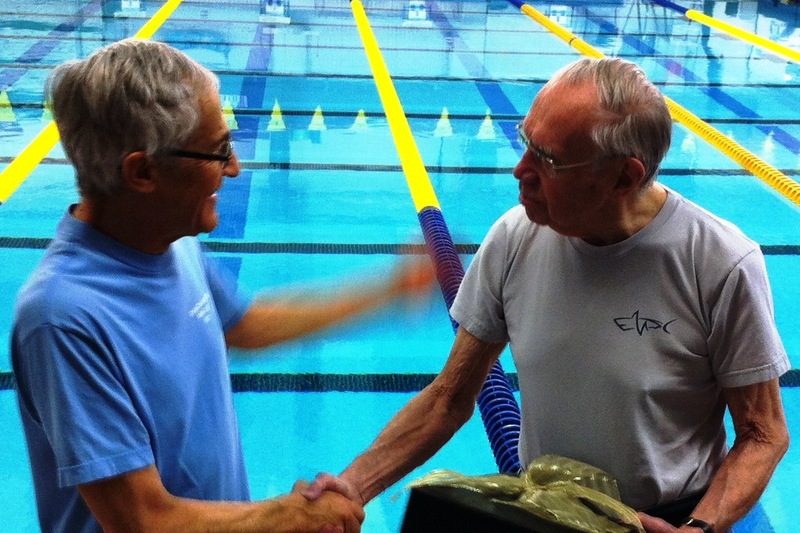 At that point, Bob McRory, who swam with Neil for many years, made the presentation. me in this manner. I was more than a little touched by your spoken thoughts and by the whole gesture! I will certainly treasure the gift (and the inscription) for all time! I have so many great memories of my years with the EMSC and this will just add to those memories and to the wonderful friendships forged with members of the Club over the past thirty-five years! you all for a swim practice in the not too distant future. This entry was posted in Awards, Of Interest, Photos, Volunteers. Bookmark the permalink.